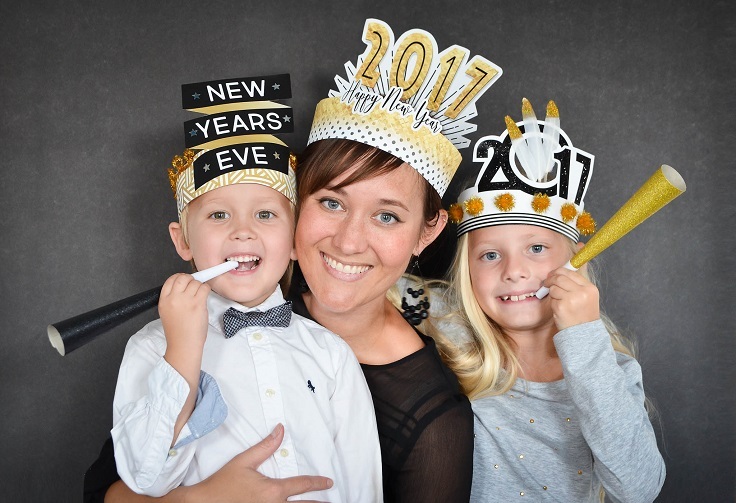 With 2017 just around the corner, it’s time to throw a party and say goodbye to everything from this year! What’s better than celebrating this moment together with close friends and family, while being surrounded with good food and pretty decorations? If you’re the type of person who appreciates the DIY lifestyle, we’re sure that you will also want to decorate something in the spirit of New year. That’s why, we are showing you below ten amazing ideas, all very easy and budget – friendly. Check them out and let us know which is your favorite! Garlands are a must for a party! 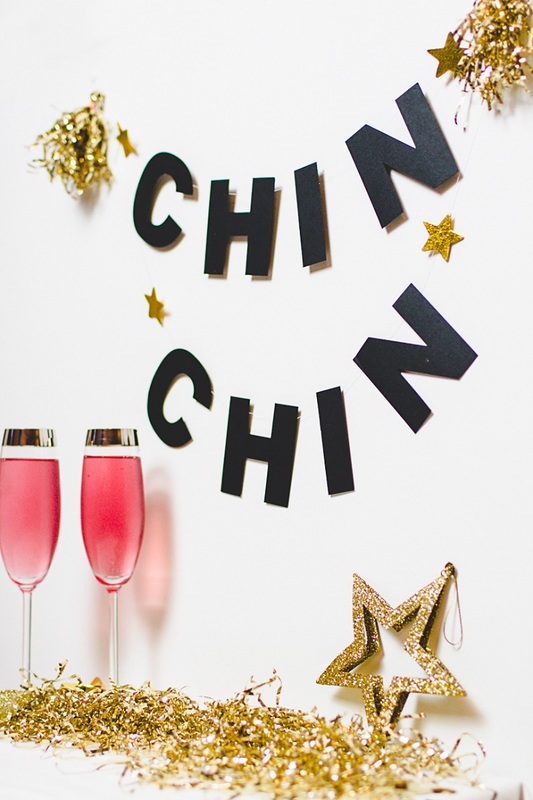 No matter if it is a baby shower, a birthday or a New Year’s party, they can make the whole atmosphere much better just by looking pretty and being an interesting phrase, such as “Chin Chin” in this case. If you like this garland, you will need fee materials – black card, a “Chin Chin” template that you can download for free at the website below the picture, craft gold stars, gold tinsel, white thread, loom bands (preferably orange, yellow or clear) and glue or sellotape. What’s a party without party hats? This project is really creative and leaves you with so many options to try. The best part about it is that you can download for free the templates for all three party hats on the picture. You can use all or just pick one or two and go along with them. Besides the printable templates, you need cardstock, printer, scissors, glue or tape and decorative stuff like glitter, sequins, pom poms and feathers. Balloons are a must and it’s so nice to have them around especially when they can look this cute! 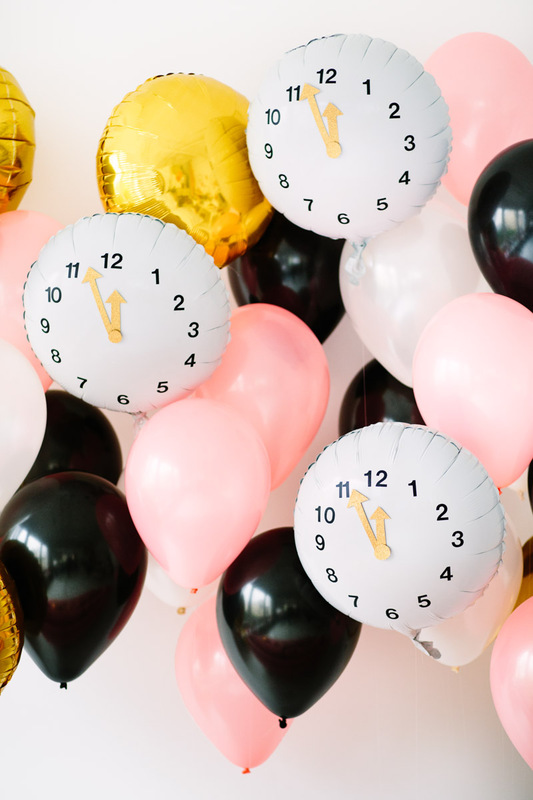 Instead of dull balloons, this year have cool ones with clock on them. For this project, you’ll need mylar/foil balloons, vinyl number stickers, twine (or you can use string or ribbon), gold glitter cardstock and masking tape or glue dots. It’s so easy and fun! Glitter can really make an atmosphere especially when it comes down to parties. There is something really magical about glittery stuff! We’re talking about celebration here, so maybe you will want to have a champagne bottle for that occasion. 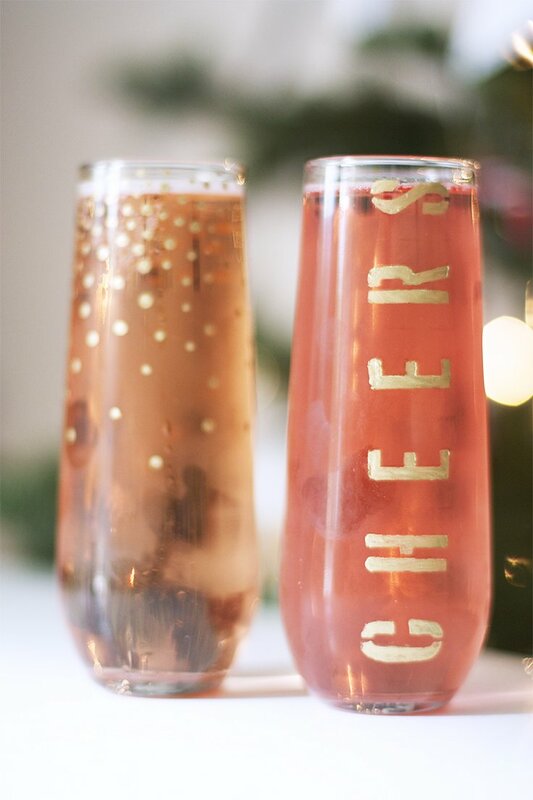 Instead of serving the bottle just the way it is, you can dip it in glitter! For this project, make sure you have spray glue, glitter, ribbon, scissors and sealer. 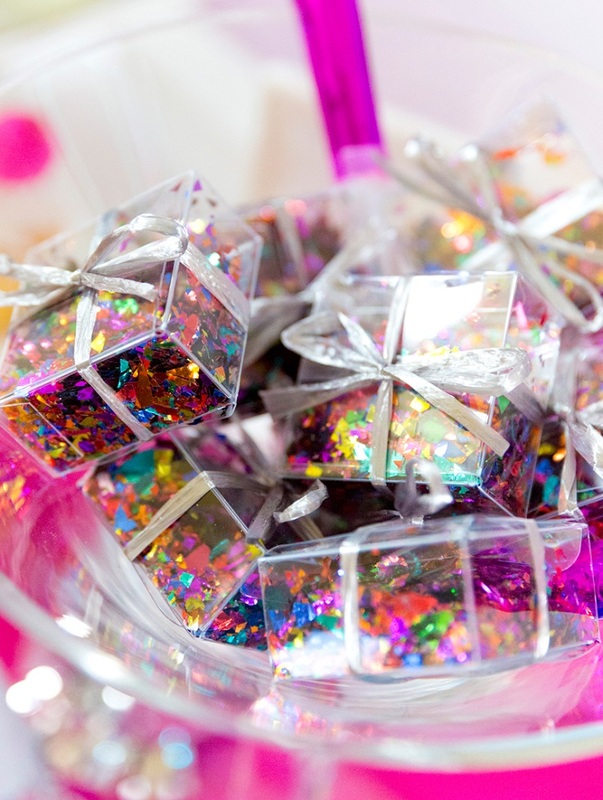 Cute and tiny, these boxes filled with glitter can be the perfect little decoration for you New Year’s party. They are also a budget – friendly project that you can do it in such a short time. First you’ll need to visit a party store or any other store where you can find mini boxes such as those on the picture, confetti and a ribbon for the boxes. If you are a fan of Great Gatsby, consider decorating your party inspired by 1920’s. 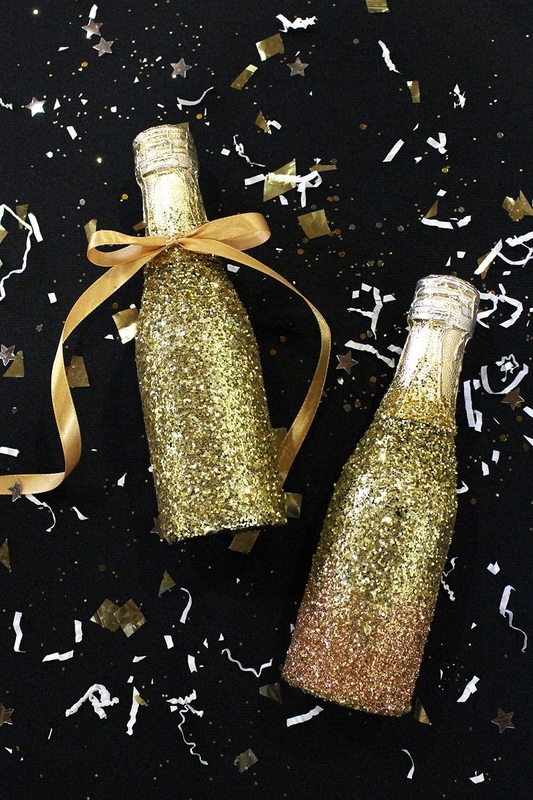 We previously showed you an idea with glittery champagne bottles, but this one has less glitter and it is equally amazing. 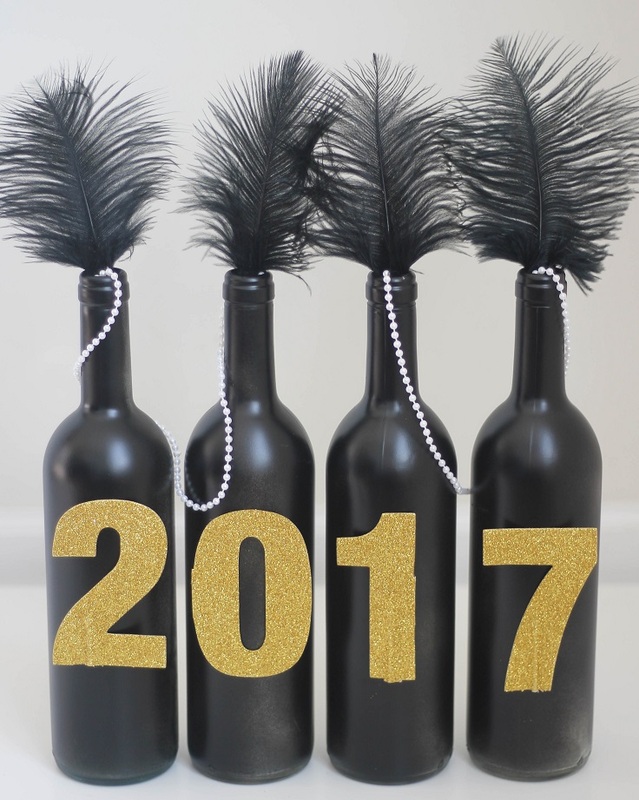 For this project, you’ll need black spray paint, black ostrich feathers, gold glitter table numbers, hot glue gun, scissors and white spool of pearls. This is such a stylish project! This project not only will be such a cute, little decoration, but it will also make things fun a little bit. Each of your guests including you, can write down on a piece of paper a resolution and the next New Year’s party you can open the folded paper and see if things came true! 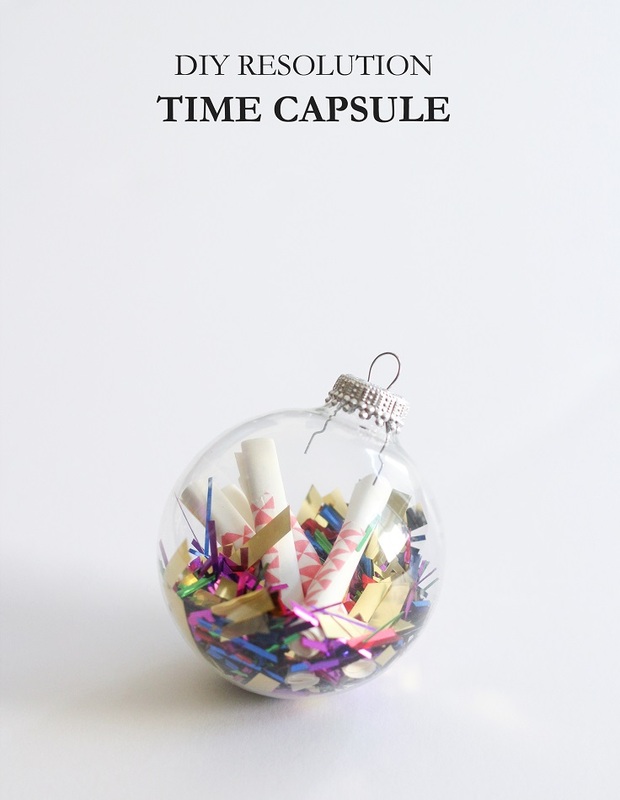 For this project, you need a clear ornament, confetti, paper and pen. So cheap, easy to make it and very creative! One of the things that you can decorate as well are the glasses. Even they can be decorated in the spirit of the holidays, so why not try it? You just need glasses (you can buy flute glasses as pictured), adhesive stencils and glass paint. Make sure the glass paint that you’ll buy is dishwasher safe and follow the instructions on it – it is sometimes recommended to wait 3 days after you bake it. 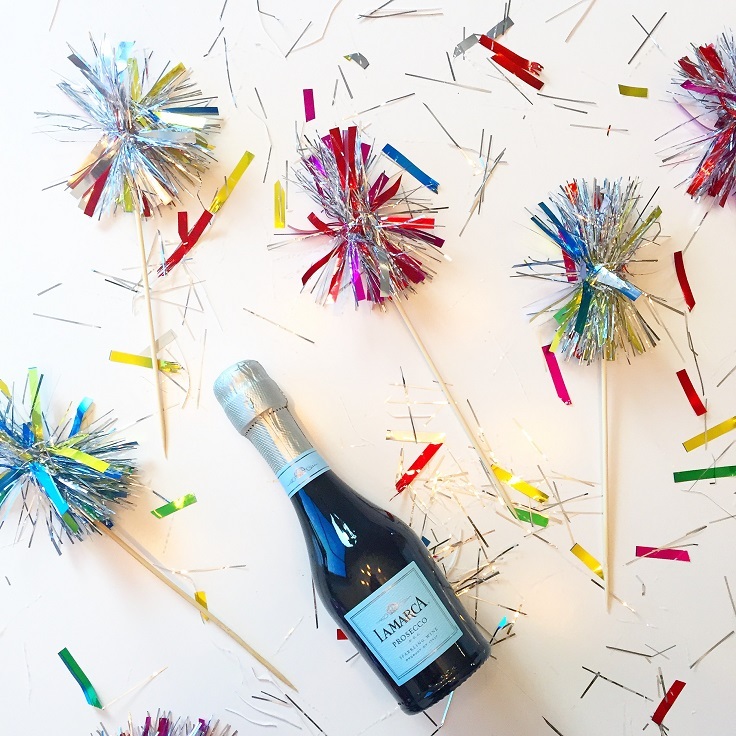 We’re back to the confetti again – this time we have the poppers. These are so adorable! You need fringe scissors, scissors, tissue paper, popsicle molds and printed labels that you can download for free on the website below the picture, or you can create your own. 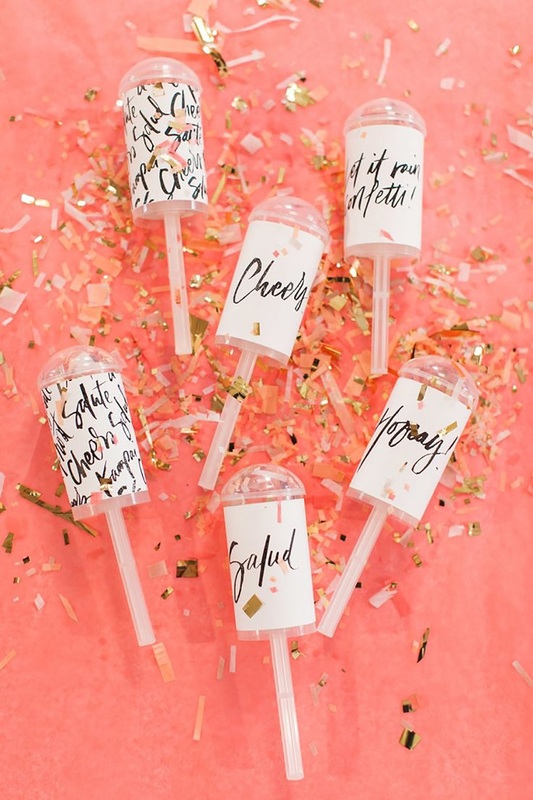 Everyone would like a confetti popper pretty like these! And last on the list are the drink stirrers! You just need strand of garland, glue and skewers. This super budget – friendly project is also very easy. Cut the tinsel in the size you want and dab glue at the top of the skewers. Wrap the piece of tinsel around the glued part and pinch it for few seconds to make sure they are glued to it. Wait for an hour for the glue to dry and then feel free to use them.